This coming Monday, January 18th, Hollingshead's Deli in Orange, CA will be celebrating the official launch of Founders Brewing Company in Orange County. I love Founders Brewing beers, among my favorites are their All Day IPA and Centennial IPA. Being able to get some of my favorite beers in California makes me so happy, because it saves me money from having to travel out of the area, which means I have more money to spend on beers. I'm super excited to have the chance to try some new to me beers as well as some old favorites. When: January 18th, 2016 from 4:00-8:00 p.m.
What: 13 beers will be available as well as guests from Founders Brewing who will be available to answer questions. Paso Robles, CA: With a new ingredient and a bit of wizardry, Firestone Walker's Velvet Merlin oatmeal stout has been transformed into a mindblowing mouthful known as Nitro Merlin Milk Stout, to be released starting on January 6, 2016. "We've experimented with Velvet Merlin as both a milk stout and as a nitro beer, but this is the first time we've married the two styles." said Brewmaster Matt Brynildson. "This combination is really magical, to the point where you can't imagine one without the other once you taste it." 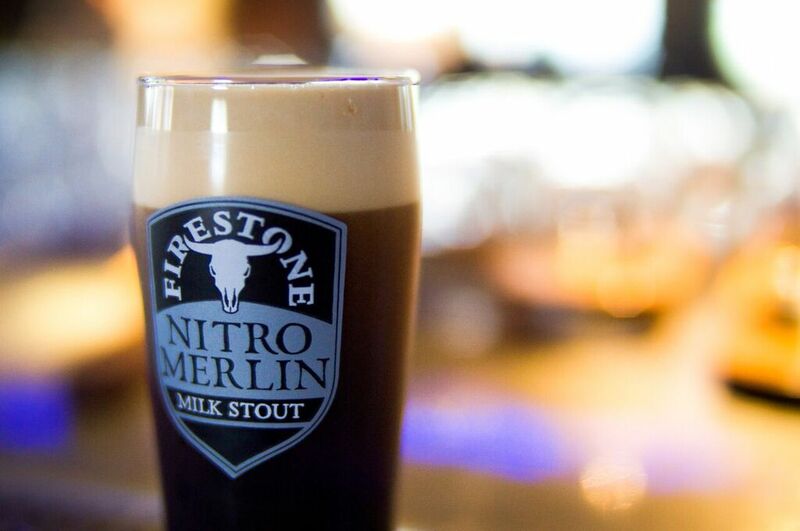 Nitro Merlin Milk Stout marks Firestone Walker's first broad-market foray into nitro beers. It will be available in draft year-round across Firestone Walker markets nationwide--starting with a series of "Milk & Cookies" promotions in collaboration with Brown Butter Cookie Company, a beloved family operation located in Firestone Walker's backyard of California's Central Coast. Nitro Merlin Stout is brewed exactly the same as Firestone's winter seasonal Velvet Merlin oatmeal stout, but with one critical twist; the inclusion of non-fermentable lactose sugar (a.k.a. milk sugar), the ingredient that transforms the beer into a milk stout. "With a traditional dry stout like Velvet Merlin, you're using these roasted barleys that add astringency, with a fairly high hopping rate that adds bitterness," Brynildson said. "But when you add milk sugar into the mix, you counterbalance those more astringent qualities. It's a lot like adding cream to your dark roasted coffee." He added, "The result is a stout that is still roasty, but with this mellow sweetness and a roundness of body that is only enhanced by the nitro format." Nitro beer was originally popularized as a way to mimic the classic British cask ale experience, which is known for delivering a thick creamy head and an ultra-smooth mouthfeel with less carbonation. "The challenge with cask ale is that you're dealing with a live fermentation, and a lot of things can go wrong," Brynildson said. "Nitrogenating a stable beer is the solution for capturing a similar head and mouthfeel while bulletproofing the process." When a nitro beer is poured, it is pushed through a dedicated "sparkler" nozzle on the tap that sheers the liquid and knocks the nitrogen out of the solution. "You get this cascading waterfall effect in the glass and this temporary visual whiteout of the beer," Brynildson said. "That's the nitrogen coming out of solution, and then it migrates to the top to create this beautiful foam. The presentation is just fantastic. Nitro isn't just about head retention and palate smoothness, it's also about the theater of the pour." He added, "With Nitro Merlin Milk Stout, you've got this dark, roasty beer that looks really ominous, yet on nitro it's so smooth and creamy and drinkable. It's a visual mindf***, and a complete transformation on the palate--especially with the added dimension of the milk sugar." The release of Nitro Merlin Milk Stout coincides with a series of "Milk & Cookies" promotions to be held in select markets, with the beer being served with cookies provided by Brown Butter Cookie Company. The company's signature shortbread cookies are made with browned butter, brown sugar, and vanilla with a touch of sea salt. "Brown Butter Cookie Company is a hometown favorite created by two sisters here on the Central Coast," Brynildson said. "This is a pairing of local flavors that taste really awesome together." Details on upcoming Milk & Cookies pairings will be forthcoming at FirestoneBeer.com.